Start off with a beat, wood sticks on cigar boxes will do. Add some chimes as accent, a Farfisa organ or record player for a voice, several other instruments for harmony and dissonance, and you’re still just on the tip of the iceberg for understanding Cybraphon. 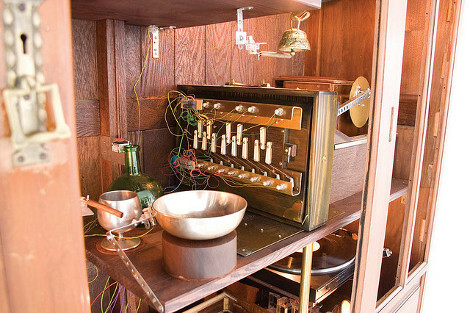 Not only is this antique wardrobe completely autonomous, playing music with over 60 robotic instruments, its song are based on the current mood of the internet. You definitely don’t want to miss the video (or pictures) on this one, catch it after the rift. [Markus Kison] built a device called Pulse, which is part art installation and part data visualization tool. What the emotional visualization organism called Pulse actually does is scan new posts on Blogger.com blogs for synonyms of keywords related to 24 distinct emotions from eight emotional groups. A red cone in the center expands when keywords are detected, in effect acting as a mood indicator for Blogger.com blogs. 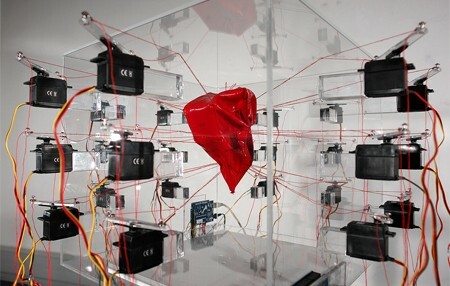 The 24 distinct emotions are based on [Robert Plutchik]’s psychoevolutionary theory of emotion, and the device itself is built from a glass case, various servo motors, and custom controller for the servos. This is a compelling idea, but we wonder whether it scans for modifying words or just the keywords alone. It wouldn’t make a lot of sense to have the sadness region expand drastically if many people simultaneously post the sentence “I’m not sad at all.” Video embedded after the break.